A couple of months ago in what felt like a sea of no’s and setbacks, I lost my self-confidence. Do you know that feeling? When you begin to doubt yourself, your abilities, plans and dreams? Well it hit me big time. When anyone would ask me what I had going on I had to hold back the tears as I tried muster up a confident answer. You see, I didn’t sell as many books as I was hoping to. I thought if I worked hard enough I would be adding Best Selling Author to my bio. I put all that I had in to getting the book out there and my expectations on what was going to happen were high. And what happened when they weren’t met? I felt like a failure. And my confidence plummeted. But, as someone who knows the mental health downward spiral, I knew what the situation called for. And that was action. Even if it felt HARD. So I kept going for it with my Live show I’ve been doing (and LOVING), despite kicking away a black dog at my heels and many, many tears. Feeling really stressed out, I asked myself a week or so ago, What’s good? And along with many personal things in my life, the answer was my show. ‘It’s time to back yourself’, a voice in my head said, loud and clear. And that’s been my mantra I’ve been repeating to myself ever since. BACK YOURSELF. It feels good and it’s working. I really thought I had screwed up motherhood. After my second daughter was born I didn’t cope the way I wanted to, didn’t act in a way I was proud of and I felt like I had failed as a mum. Big time. Every night when I went to bed I would go through all the things I had done wrong that day - I didn’t give my girls any vegetables, I hadn’t taught then their ABCs, I’d lost it at them, I let them watch too much TV.... I read book after book on parenting which only made me feel worse and worse. When my Dad died I realized all the things that I found so frustrating and annoying about him didn’t matter. All I thought about and continue to were the wonderful things about him and the great times we had together. That’s what I think about now when I look back at the 11.5 years of motherhood I’ve had so far. Through forgiving myself I can now remember so many moments that I have been an amazing mum. Moments of cuddles, reading stories and dancing round the living room swinging my little girls in the air. I’ve asked my daughters if there’s certain things they remember that I feel ashamed of and, like my memories of my Dad, their answer is no. They remember the fun, joyous times of which there have been plenty. Forgiveness can free you from regret. It’s a powerful thing. Is there something you need to forgive yourself for? When My Deal Australia asked me to create a page with all my products I knew straight away what was going to go on it - everything you need to Two Minute Move of course! Blenders, Wine, Yoga mats, brooms and more. Massive bargains to be had. Check it out HERE and use the code lizzy10 to get $10 off a minimum $100 spend. Muting your mean girl, becoming a wrestling world champion, managing hormones plus more lessons learnt from my show. Hi Two Minute Mover. I arrived at Melissa Ambrosini's home yesterday to film a live episode of Two Minute Moves TV. I was pumped and nervous. Melissa did an Instagram Story shout-out to her 101K followers that we were about to go live and guess what? I couldn't get the damn technology working. Trying to control my panic, no matter what I did the screen remained black when I tried to go Live. We ended up recording so I could upload later and it was a wonderful conversation that I highly recommend you watch - especially if you have a 'mean girl' in your head that likes to tell you everything that you're doing wrong and that you're not good enough. But boy, oh, boy did my mean girl get stuck in to me on the way home. But thanks to some brilliant steps I'd learnt from Melissa I was able to take some deep breaths and mute that mean girl. It made me realise just how prevalent that voice is in my head so I'm on a mission to practise every day to change it. This is one of the MANY lessons, action steps and insights my amazing guests have shared on these episodes. Have a watch and discover the little things you can easily do that make a big difference to the way you feel and live your life. ps. Anyone you'd love to see on the show? Drop me a line and I'll ask them. Want an easy way to get fitter? Chances are you could do with some more cardio in your week. This is an easy way to get it in. Even if the weather is bad outside, you've got kids at home, you can't get to the gym or whatever that excuses voice is telling you - probably that you don't have the TIME - you can do this workout. Remember something is so much better than nothing because it means you start which creates momentum. Plus, all the little moments you take to give back to yourself add up to make a big difference to your fitness and the way you feel. A cardio and strengthening workout for your whole body as you're sweeping and scrubbing your floor. These moves are a sure-fire way to take the boredom and resentment out of household chores and turn them in to an endorphin boosting, body strengthening, fun part of your day. No time to exercise? When I was at one of the darkest points in my life I started doing two minutes of exercise and somehow, thanks to this incredibly powerful tool called movement, I found myself climbing back out of this downward spiral and in to a place where I could look at my beautiful baby and toddler again and experience true joy. Two minutes was all I had in me some days be it from time, exhaustion, lack of motivation or my mood. But some days, I could do more. The 10X2 Workout has been born from many of you asking me for more. I love the idea of doing 10 x 2 minute intervals. It feels more achievable somehow. You can tell that excuses voice, Just do 2 minutes. Now another 2 minutes, and before you know it you’ve spent 20 minutes giving back to your body, mind and soul. The workouts are catered to all fitness levels and will have you feeling stronger, fitter, more energized and more at peace with the world. We’ll have some fun with them too by sometimes picking up a wine bottle to use as weights. This is already turning in to a very special community of people who have become members. On a private Facebook page, you’ll get 10 new workouts a month, many of which will be live but all will be available to watch back any time. They’ll also be delivered to your inbox by 5am. As a member you are also going to have me making sure you don’t miss out each week on the incredible benefits that exercise brings not only to you but also the people you love and to what you are contributing to the world. If you sometimes need a gentle kick up the backside to make your health and fitness a priority then I’m your gal. You’ll have access to plenty more good stuff going on as a member. You’re going to love it. And I made it $2 a week because I didn’t want money getting in the way of you investing in the most important person to take care of - YOU. Everytime a fad diet pops up on the scene we’re given a new meaning for the word bland. Cut out carbs? No thank you. Quit sugar? In your dreams. Eat only liquids? Maybe in the space age. We wanted to get to the bottom of healthy eating so we asked a few of our favourite fitness professionals to tell us about their day. Here’s what 5 fitness gurus eat in a day - and it's simpler and tasiter than you'd think! Feeling apathetic, unmotivated or mourning the weekend? These two moves will give you the energy and mood boost you need to kick the blues away and be ready to get in to your week. If they work on my highly-emotional Miss 9-year-old, I'm pretty sure they will work on you! Watch it HERE or click the image. So, my dear Two Minute Mover, I was waiting. And it was driving me crazy. After my book coming out last year the plan was to do a show next. But I needed some cash to shoot it properly so I could afford to have a second camera, a crew. I needed my profile to be bigger so guests would say yes. I waited. Then because ABC was interested in doing a show with me I waited, and waited to hear back from them if it was a yes. While I was waiting I didn't take any action and it was really making me feel depressed. I have since realised that moments in my life that I have been waiting for the 'conditions to be perfect' and not taking any action are the moments I have felt really blah and stuck. The big one was when I was waiting to have more time to exercise and so I did nothing. An interesting thing happened to me when I was on school holidays in Noosa staying with my mum. I went for a jog through the National Park and ended up jogging alongside someone. We got in to a conversation, which I've never done before on a jog with a stranger, and she started telling me about how she'd recently been to see motivational speaker, Tony Robbins, on stage. When I asked her the thing she really took from the weekend, her response was, 'resourcefulness'. The idea that if you want to do something and there are a lot of barriers in your way, you get resourceful until you can find another way to make that happen. I felt like I was meant to meet this woman to hear this word and to realise that all these barriers that I thought were getting in the way of producing a show in the hope that it would inspire you to bust through your exercise excuses and get moving more, were totally possible to overcome. It was this set idea of how it had to be to be 'perfect' that was getting in my way. I love the parallels to exercise of this lesson. Before I had kids, I always had this idea of what exercise needed to look like. I know I'm not alone in this mindset. If it can't be that hour, a certain intensity and location, that instead of doing something we don't do anything at all. So what did I have to do after ABC passed on the show and a big personal investment financially wasn't possible? I thought, ok, what is available to me to film this show without a massive budget/crew/network etc? The answer was, I could film these episodes LIVE and therefore I didn't need to have all the time and money to edit and put it all together. So that's what I decided to do. My phone wasn't going to cut it for this length of time and for the set up with two people working out together so I worked out how to go live through my camcorder which I did after hours of research and several tantrums which my kids could happily tell you all about. Then it was time to go out and do my first episode of Two Minute Moves with special guests. I was so, so nervous as I knocked on the door of my first guest, Lucy Bloom. But as I left I was so excited because I had BEGUN! This was no longer just talk or excuses. It was the beginning. That was my big lesson so far for 2018. Waiting does not suit me. I need that momentum feeling that taking action brings. This lesson of resourcefulness has helped me be able to bring you this show. You can watch the Live episodes on Facebook or YouTube. Like the Two Minute Moves Facebook page and subscribe to YouTube to be part of it. ps. For the next Two Minute Moves Live Show I'm visiting the fabulous Channel Nine Journalist, Amelia Adams, who did an amazing quote for my book. Thursday 1st of March at 1:30pm. Pop it in your diary - it's going to be a good one. Two Minute Moves LIVE with Lucy Bloom. 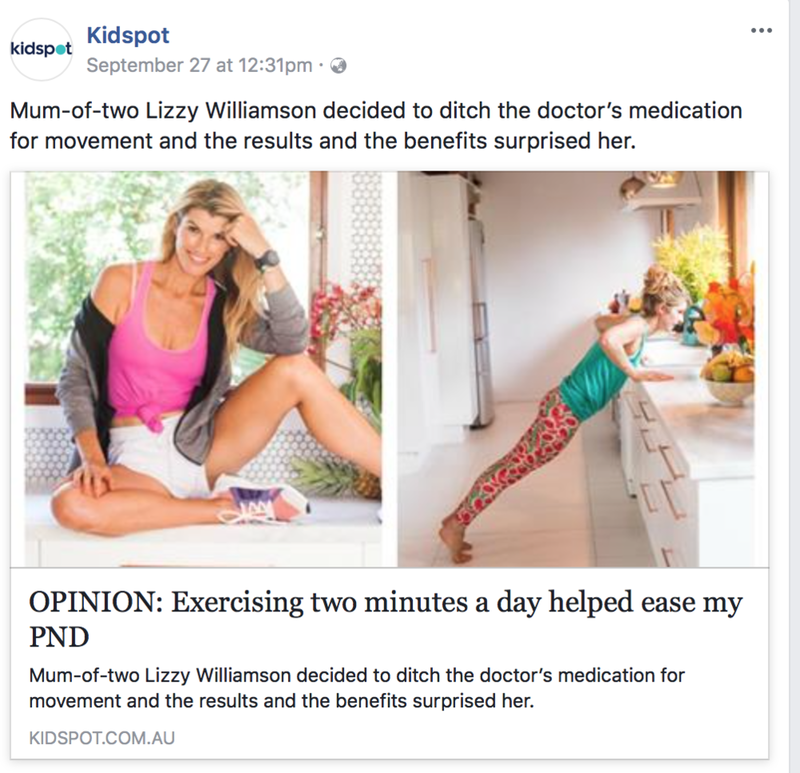 Two Minute Moves LIVE with Elka Whalan. Elka is one of those people you meet that radiates positivity and joy. When you talk to her you feel like you can do anything! She is an incredible champion of women in her work with QueenHood and so much more. I was lucky enough to have her host my book launch last year. In this episode of Two Minute Moves LIVE, I visit Elka to talk about exercise mindset (this woman is an Olympian after all) and how she now makes it a part of her life with four kids and a rocking career. Elka and I end up having a very fun dance-off with her one-year-old in tow. So fun. Watch it HERE on YouTube or HERE on Facebook. It's Wine Bottle Workout time! No need for fancy equipment, dumbbells or a whole lot of time. Some time this weekend grab a couple of bottles and take two minutes to get your heart pumping and your arms burning with this fun, fast workout that's sure to put a smile on your face. Watch it HERE or click the image. ps. Subscribe to the channel while you're there for more reminders to get up and get moving. Are you finding you're getting less flexible as you get older? Or maybe you're starting to get a few aches and pains, injuries or even some creaks as you stand up. are making yourself a priority. are worth taking a moment for. Here is a Two Minute 'Morning Stretch Out' for you. You don't need the flexibility of a ballerina to do them. They are simple and feel amazing. It's these little moments that add up to make a big difference. In celebration of Hornsby Ku-ring-gai International Women’s Day Festival Week, North Shore Mums is hosting a special evening on Wednesday 7 March at St Ives Shopping Village. In keeping with the festival theme of #lovemefirst, I'm part of a panel of incredibly inspiring mums who will make you realise the importance of looking after yourself as a person, so you that you can be a better mum. Tickets are $25, and include a glass of bubbles, nibbles, talks from Elka, Kristina and myself, a goodie bag and some fabulous lucky door prizes. Tickets on sale now! Click here to buy tickets via Eventbrite. By the way, are you a podcast fan? I sure am. I put them on when I'm driving, walking or cleaning the house. Most recently I've been on Lisa York's Super Mum podcast which is awesome. Have a listen HERE. For a full list of my fave podcasts visit my media page HERE. My book, Two Minute Moves, was published last year and with it came some incredible moments. After a year of a 5am hour of writing every morning, then another year of getting a publisher, working with an editor, and doing photos, then another six months of waiting for the book to launch, I was so ready to have that thing in my hands. And it was a crazy feeling when it arrived - I even filmed myself doing a dance-off with all the pent-up emotions I was feeling. 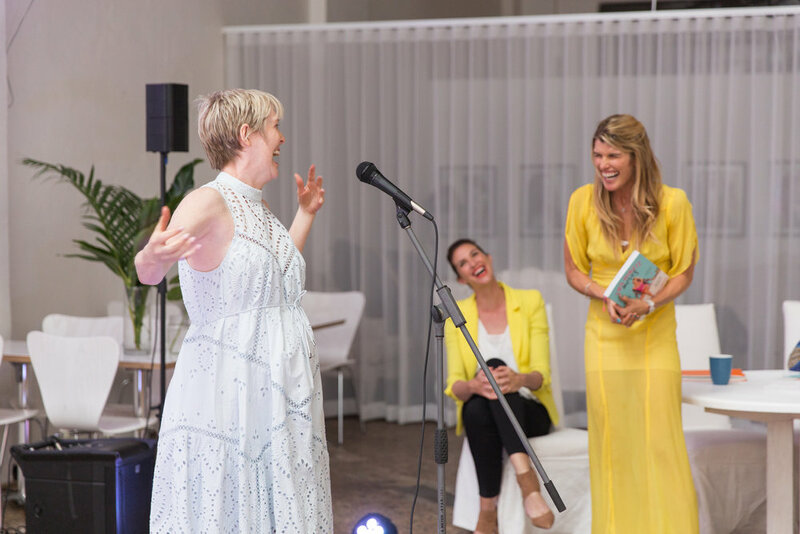 It would be easy for me to only reel off all the wonderful times that followed like the night I launched my book surrounded by family and friends, hosted by the divine Elka Whalan. (A gorgeous and pregnant Stacy Clare is pictured speaking here). Or when I discovered my love of live tv thanks to segments on Studio 10 and Today Show. Plus kicking some big goals by being featured in some fab mags, podcasts and blogs which you can see/listen to HERE - Pictured here is Collective Hub which has been on my wishlist and vision board for years. Photo by Tanya Lake from Two Minute Moves, the book. You can go back to the easier road you know. No-one is forcing you to choose this path, to put yourself out there for criticism and failure. Are you sure you want to do this? As I sat there and breathed between long sips of my champas, it was totally clear to me what the answer was. Why? Because the one thing that got me through all those dark times was exercise. Every night without fail I'd make myself do 20 push-ups at my kitchen bench. I'd head out for a walk despite it being the last thing I felt like doing. I kept dancing with my daughters in my kitchen every night. I know there is no way I can keep the power of exercise to myself. So here I am with lots of great things lined up for you in 2018 to keep that precious body of yours moving. Along with the moves and motivation I've got going on for you over at the @twominutemoves Instagram and Facebook pages, first up for you is a workout to get that often underused muscle - your glutes - firing and lifting from the comfort of your couch. Good Morning America got in touch with me about featuring this workout so I thought if it's good enough for an American morning show then it's good enough for you! It's also a perfect workout for this time of year when, if you're anything like me, you get to the end of your day and are sooooooo ready to crash on the couch. Maybe that's something to do with the fact my kids had 8 school or dance concerts in 4 days. So go ahead and lean back on the couch while you're binge-watching Netflix or checking your emails. While you're at it, try these three moves to give your core some love. I'll be back Feb 1st 2018 to deliver a whole lot of fitness inspiration and motivation to your inbox. Pop in your details to get your exercise and mindset back on track. When I hit my lowest point nine years ago I didn’t know I had post-natal depression, I just knew that I wasn’t coping. I didn’t want to get out of bed in the morning or leave the house during the day. I’d count down the hours until night-time and then go to bed dreading the long, sleepless hours ahead. I was shocked at the emotions I was feeling. I was punching my brick walls with anger as I went up the stairs of our home to settle one of my daughters. Once, in a moment of fury and frustration, I stabbed a knife into a cutting board, snapping the handle off. I’ll never forget my oldest daughter’s look of terror at one of my fits of rage. I could never have imagined my own child fearing me. As I held my baby daughter in the girls’ top-floor bedroom, I would look out the window and think about throwing her out of it. My strategy was to keep telling myself to get over it. But no matter how much I tried to convince myself that I shouldn’t be feeling this way with all that I had – two healthy children, a home, food to eat, a partner and family I could call on – I couldn’t. I didn’t tell anyone how I was feeling because I was so ashamed. There were so many people far worse off than I was, people who needed help so much more than me. I couldn’t justify asking for help. Most people experiencing symptoms of a mental illness don’t seek help from health services. If I had consulted my doctor or called an organisation such as Lifeline, Beyond Blue, Black Dog Institute or PANDA (Perinatal Anxiety and Depression Australia), I would have realised sooner that there were better strategies available than silence. Physical exercise can have a powerful effect on mental health, and it’s widely considered a significant part of treatment for depression, so they may even have suggested that I start moving.